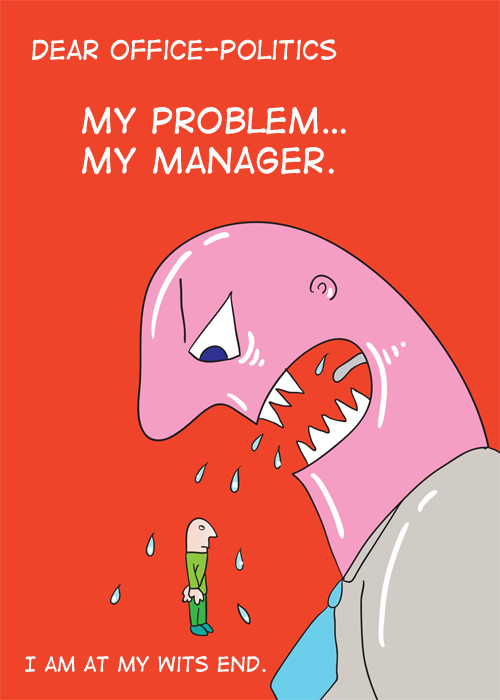 Office-Politics » My problem… My Manager. I work for a very large world-wide distribution center. My location, however, is a very small “off spring” branch that has only two employees, myself and the branch manager. Let me start by saying I love my job! I love the people I deal with over the phone, the few walk in customers and the work load. My problem… My Manager. I am at my wits end. I honestly don’t know where to turn. I know that if I were to do the things my boss does, I would have been fired! He spends most of his days surfing the internet and posting in chat rooms. When he’s not playing on the computer he’s on his cell phone. He is a part time police officer and many a time he is called away for police related work. He has left our store to go to court. I am told that if upper management calls, I’m to say he is on a sales call. Upper Management is aware of his part time position, but has little knowledge of his leaving our office for his police duties. Several days at work he is so tired from his night shift that he will go into his office to sleep for hours. I am told not to disturb him. Since I’ve work at this company, a little over a year, I have seen him go through four different relationships where his relationship problems have always been brought into the work place. I have witnessed arguments over the phone where he has gone off in a tirade of insults and swearing, while I’m left praying that a customer does not come into the store. His latest fiancee arrives at our store every morning for an hour of talk and coffee. He will leave our office every day between 1 to 2 hours earlier than his scheduled departure time. Whenever anything goes wrong… it’s always my fault. Even when I show him that the error is his, he is never to blame. He is a very moody person prone to mood swings. He has been on several different medications for his depression and is ALWAYS sick! He always has a concealed weapon on his person. I once asked if this was allowed since our building has a strict No smoking/No weapons… and I was told that he is above the law… he is a part time police officer who does not have to answer to our building code. He’ll smoke at our front counter without hesitation. He has been rude to our customers. He is very lazy. Rarely will he pick up the phone, knowing that I will take the call. He truly does not want to be at our company, but he is paid very well. Our store is doing very well and makes a good profit… especially within the last year. If I were to go and complain, he would know where the complaint came from. He would make my work extremely difficult. He has a terrible temper, and I don’t trust him when he’s angry. I’m frustrated that his manager does not come into our branch more often. I feel that I’m all alone and no one will help me. I love my job. I want to continue learning, but my boss has no desire to teach. I don’t know where to turn or what to do. I want to keep my job. I HAVE to work. My family depends on my incomes. My husband was recently laid off and my boss knows this. I work hard for my income and have no complaints of the work load. However, I need to feel safe. I’m afraid if I complain I will not be protected by Upper Management. After all… it’s only he and I that work at this branch and he will know that the complaint was initiated by me. Please…. Please… any advice you could provide would be greatly appreciated and strongly taken into consideration. Thank you in advance for your time and help! I write to you in the strictest of confidence! You are indeed in a delicate and difficult situation. You are right to be very cautious in how you deal with it. The first consideration is your personal safety, both physically and psychologically. Dealing with your manager may provoke a retributive response from him. Even if he did not become violent, it appears likely that he would do all that he could to make life unpleasant for you if he was aware that you were behind any disciplinary action from upper management. There are three possible course of action that occur to me. A fourth possibility is to continue with the status quo, but that is obviously not sustainable. You will reach a breaking point at some time. You are wise to be seeking a better option. Examining the first alternative (Confront your manager directly), I do not suggest this is an appropriate way to approach the issue, nor is it likely to succeed given the nature of your manager. Following this course of action would call for you to sit down with him, telling him how his behaviour is affecting you and seeking to develop a course of action that will allow the two of you to work towards a mutually agreeable resolution. To say that this is unlikely to go well with this personality is putting it mildly. Clearly this situation is one of inadequate managerial supervision. Given that your store is doing well in sales it is not totally unsurprising that upper management has not been watching more closely. Many firms are content to let matters go along without adequate oversight if the numbers are good. It may be that upper management is more aware of the situation than you imagine, but feels that if the store is profitable they are willing to put up with it. In pursuing the second option (Report his behaviour to his manager) you need to proceed with great caution. The first thing to do is to keep a careful record of your manager’s behaviour for at least a month, several would be better. You don’t need to tape his conversations or make notes right at the moment. In an unobtrusive way, however, you should write down everything that seems out of line to you. Note down the time he arrives and the length of each personal phone call. Make a note of the swearing, the smoking and the carrying of a firearm. Times and dates are critical. The next step is the really delicate one and it depends in part at least on the nature of your relationship with your manager’s supervisor. If you really don’t know the person then you need to proceed with great caution. Call the person and ask for a private and confidential appointment at a location away from your store, perhaps in another town. Tell them that you have some concerns about the working relationship with your manager and ask if they are able to provide some support so that the problem can be addressed. You should present yourself as seeking advice and willing to work with the company to address a mutual problem, rather than presenting a list of demands that will make the supervisor feel defensive. At this point the ball is really in the supervisor’s court and your next move depends on his/her response. If your read is that the concerns are being taken seriously and that you will be supported and protected during the process, then proceed. If not, if you feel that the supervisor is not going to act appropriately or may take your manager’s side, then thank her/him for their time and leave. At this stage you may have burned your bridges and the only reasonable way forward may be to leave your job. If, however, the supervisor appears to take your concerns seriously and offers the sort of support that you feel will protect your interests and safety, then I would suggest that you share with them that you were advised to take a note of your manager’s behaviours that are of concern and here they are. The next step will be up to the supervisor. The challenge here is that the supervisor is not doing his or her job adequately. They are not exercising their managerial role. You are not, however, in a position to tell them what to do, or even to coach them very effectively. If the supervisor is not willing to do their job, then I do not see any way forward that is not fraught with the same, if not more, trials and tribulations than you now face. That brings us to the third option: Leave your job. One of the things that makes a difficult situation untenable is the sense we often have that there is no choice. If you really need a job and you like much of what this one involves and there are few other opportunities nearby, then you are likely feeling really stuck and powerless. One way to change that is to find yourself an alternative – even if you don’t take it. Sit down with your spouse and work out what the two of you might do if you left your job. Could you move somewhere? Could you find an alternative position, even if at a lower salary, even if it was less pleasant in some of its details? If you have no option you have no bargaining power. A colleague of mine working in a professional position faced a somewhat similar dilemma in that he felt trapped in a job he did not like. Part of his response to the dilemma was to look around the small town he lived in and see what other work was available. The only thing he could identify was a job at the local supermarket stocking shelves. He and his spouse sat down and did the budget and figured out how they could make that work. He did not, as it turned out, take the grocery job, but realizing it was available and that they would not starve if he did gave him a renewed sense of empowerment that helped him feel better about his original job. My suggestion is that you begin with that approach. Develop an alternative to continuing in this position. And then, seriously ask yourself if it is not in fact a better alternative. If you would prefer to try to work things out where you are, you do so from a position of increased power, which is always helpful. A final note, your manager sounds like an irresponsible, perhaps violent and certainly unpredictable character. Before taking any action that might alienate him you need to assess very realistically whether it is worth the risk. Based on what you have described my instinct is to say your best course of action is to leave, but I know that is not an easy thing to contemplate. I wish you well in this difficult situation. Thanks for writing to Office-Politics. I am currently working for a manager who does not live by his own rules he has laid out for other employees. He will sleep through the night shift leaving the front desk unattended while he does not even let other employees leave the desk or have a stool to sit on. Watching this behaviour is very disturbing knowing that I would be fired for acting the way he does. I choose to simply ignore it as it does not directly effect my job. I know this might not be the best approach but I feel if I was to make a complaint to management it would make my work life and schedule very difficult.